Is it just me or is bone broth everywhere lately? Whether you're vegan, or simply don't love the taste of bone broth you can still reap the bone broth benefits of all that skin-loving collagen, so I've put together this guide to some vegetarian and vegan bone broth alternatives to help boost your collagen levels naturally. Bone broths and soups are everywhere, especially coming into winter! I know lots of people are keen to pass on a good bone broth recipe - but for some people traditional bone broth products don't suit our lifestyles. While mainstream bone broth powders can be good for boosting collagen levels and are a popular way to help maintain overall health. 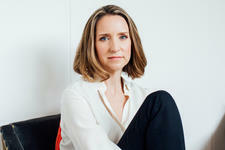 However many of us want to replenish our collagen levels in a different way. Whether because we dislike the taste of bone broth, are vegan or vegetarian, or just aren't sold on the idea of how to make bone broth, there are other natural alternatives to bone broth that provide the same benefit without using animal products, whether you'd prefer a vegan nutrient-rich vegan supplement to help increase your body's collagen production naturally, or are happy with a sweet-tasting marine collagen powder. Made famous in Australia by Pete Evans, bone broth is made by simmering animal bones, extracting the collagen, proteins, amino acids and minerals. Though the recipe sounds exactly like making traditional stock, bone broth's nutritional benefts surpass a standard soup. Bone broth is prepared by simmering the animal bones for a long time, often around 24 hours, whereas stock can only take a few hours to prepare.1 Bone broth is not actually new though, it has been around for centuries in many different cultures, known for its healing properties and nutritional benefits! Bone broth is believed to help with joint pain, gut function, immunity, and even the health of your skin and hair - this is largely due to it naturally being rich in collagen. Collagen is needed in many parts of our bodies, including our bones, muscles, blood vessels and skin. 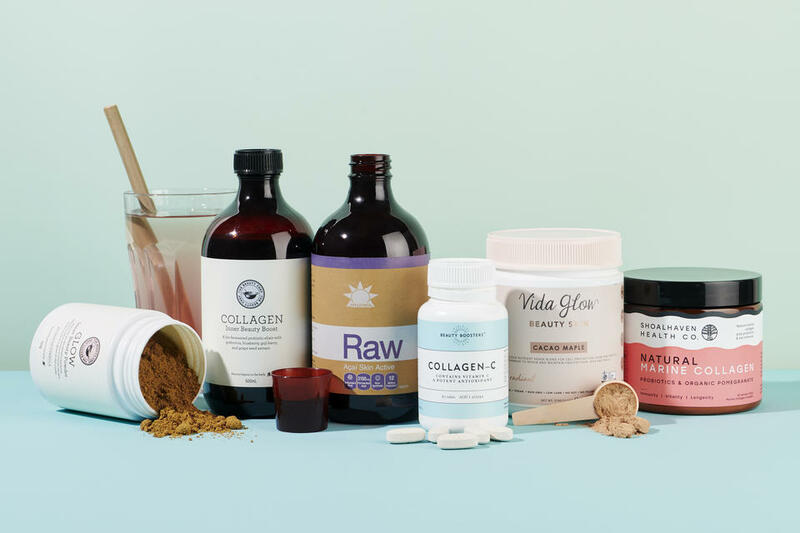 As we get older our collagen production naturally starts to slow down, making alternative sources and vegan bone broth substitutes such as collagen-boosting supplements ideal for those looking to limit signs and symptoms of ageing naturally. My personal favourite collagen supplement is the Shoalhaven Health Co. Natural Marine Collagen - Pomegranate. This delicious Pomegranate flavoured powder contains natural marine collagen which is sustainably sourced from deep sea fish. Marine collagen is known for its ability to help reduce the appearance of fine lines and wrinkles, as well as strengthen hair and nails. This powder also contains 2.5 billion probiotics per serve for good gut health! Each serving contains 2.67g of collagen, ideally taken twice daily. A great substitute if you can't stomach the taste of bone broth, this collagen powder can be mixed into any hot or cold drink. I love a teaspoon in my morning coffee for a fresh and fruity flavour as this powder does not taste fishy at all! 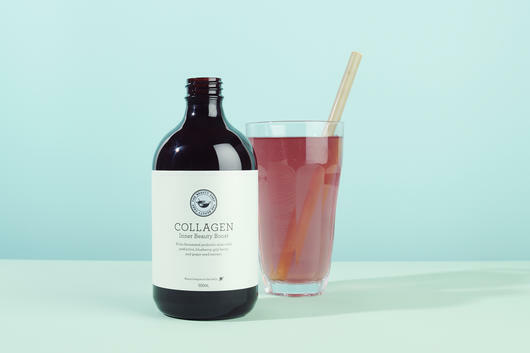 An ideal vegan alternative to bone broth, The Beauty Chef COLLAGEN Inner Beauty Boost is packed with vitamin and antioxidant-rich fermented superfruits such as Acai, Goji and Pomegranate as well as probiotics, designed to boost the skin's natural collagen production process from the inside out. 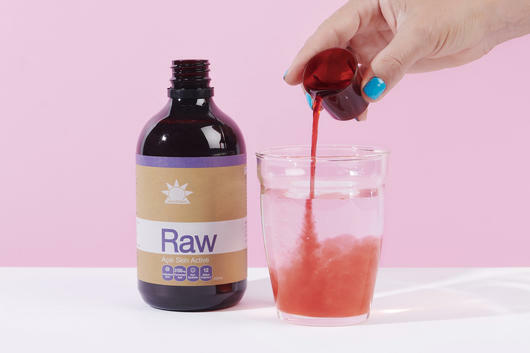 Free from gluten, dairy and added sugar, this natural supplement can be taken diluted in water to target plumper, smoother skin and shiny hair and nails. If you prefer a powder, The Beauty Chef GLOW ADVANCED Inner Beauty Powder is one of my all-time bestsellers, and with good reason! 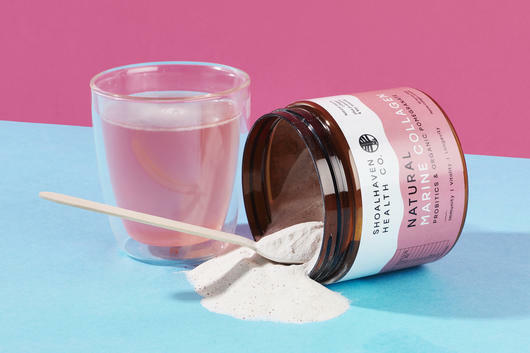 This Australian made, vegan powder actually works to promote and boost your body's natural collagen production levels as well as regulating the way your skin functions to help give your skin a gorgeous glow. All the benefits of bone broth, and more, with a fresh berry flavour! This nutrient rich blend contains fermented wholefoods and natural probiotics to support digestive function, and is perfect added to smoothies, juice or water alone. 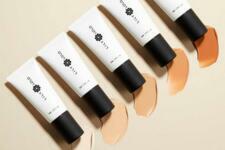 Beauty Boosters Collagen-C. 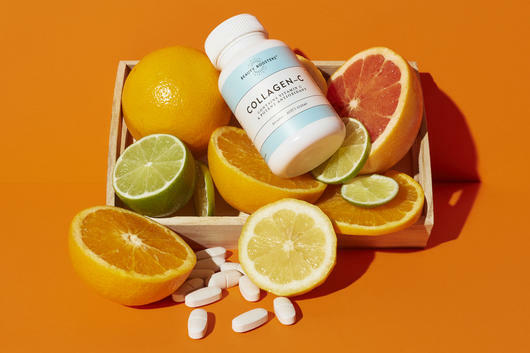 These tablets contain Vitamin C, which is necessary for the manufacture of collagen in the body and may also support the development and maintenance of bones, teeth, cartilage and connective tissue formation. Take one to two tablets daily with meals, or as directed by your healthcare professional. If symptoms persist, consult your healthcare practitioner. Always read the label. Use only as directed. Vitamin supplements should not replace a balanced diet. For adults only. 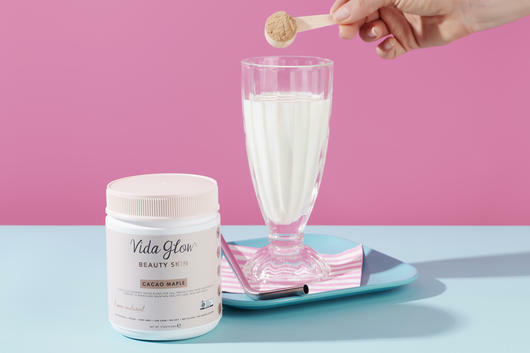 The Vida Glow Beauty Skin - Cacao Maple is another favourite collagen supplement of mine as it works to encourage collagen production within the body and may also support gut health and defend the body from free radical damage. It's packed with Omega 3 fatty acids, making it great for your hair and nails too! Fermented wholefoods such as Spinach, Chia and Sea Buckthorn are combined with Pea protein and probiotics for a nutrient rich daily supplement with a delicious malty chocolate taste from raw Cacao and natural Maple. Australian made, certified organic, vegan and gluten free, it can be added to smoothies or your choice of milk for a tasty drink that is good for you too. Another amazing vegan collagen boosting supplement is the Amazonia Raw Acai Skin Active. This rich berry elixir contains a fermented Acai probiotic blend which may help to support the body's natural collagen production and fight free radical damage. With 12 billion probiotics per serve, this certified organic blend can also help with digestion and gut health. Take one 30ml shot daily or dilute in water. Source: 1 Sydney Morning Herald.